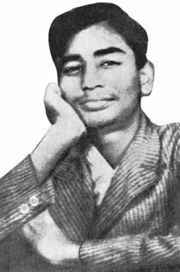 Sukanta Bhattacharya (August 15, 1926 - May 13, 1947) was one of the most honored poets of Bangla literature. He was called 'Young Nazrul' and 'Kishore Bidrohi Kobi'. Sukanta was born at his uncle's house in Kolkata. His ancestral home in the village Unshiya in Kotalipara, Gopalganj, Bengal (now part of Bangladesh). His father, Nibaran Bhattacharya, was in the book selling business in Kolkata. He died an early death at the age of 20. He was a communist and was a worker of the party. "Poetry, we do not need you anymore. A world devastated by hunger is too prosaic, The full moon now reminds us of toasted bread"